There is nothing that intersects Church and Culture as much as a Hollywood portrayal of a beloved Bible story. The reactions to the recently released Paramount Pictures film Noah has continued to prove this true. Upon hearing of the proposed production of the film many Christians preemptively began to be suspicious, simultaneously anticipating its release but perilously curious to see how Hollywood might butcher their Vacation Bible School themes of old. A tight lid was kept on the film and there was little information about the film online until its release. Since then, the cultural noise coming from Christian critics and defenders alike has come to deafening levels. Yet despite a haze of persuasive Christian personalities pleading with their constituents to avoid the picture, the film has had a strong showing at the box office; it’s as if the critics are having the opposite effect of their intent and theaters continued to be packed for the film even after pleas of abstention. 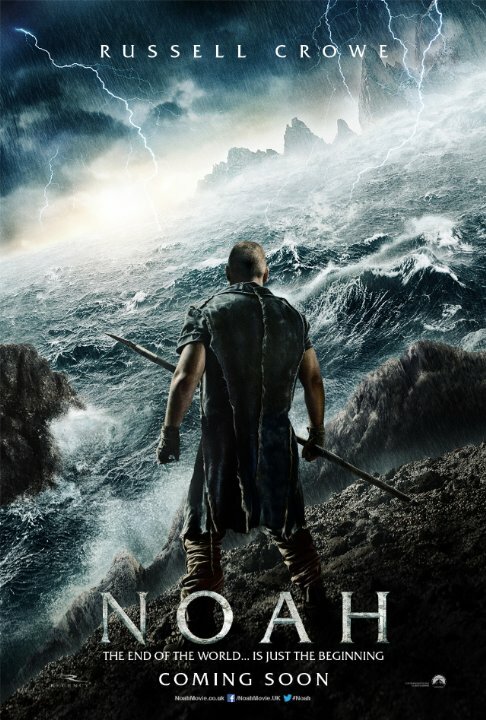 In its first weekend Noah grossed $44 million dollars in the US and had an International gross of $51 million. In Russia, the film grossed $17 million becoming the best release ever for a non-sequel film. For a film that cost $130 million to make, it was well on its way. By its second weekend at the box office Noah has eclipsed the $100 million dollar mark and set box opening box office records in several countries such as Brazil, Germany and Peru. Italy, France and Japanese markets open to the film this coming weekend. This strong showing has not assuaged the dismissals of many Christians. Before people have even seen the film they are relying on their trusted cultural voices to guide their viewing decisions. In a land where people prize liberty, freedom and personal choice, many Christians are glad to let their trusted prophets decide for them. But many of the criticisms have nothing to do with the quality of the story or the imagination of the directors. Even picking on the CGI seems like a stretch to me, especially if these viewers enjoyed Star Wars or Lord of the Rings. The criticisms seem to universally focus on its portrayal of the “actual” flood narrative and the misconstrual of characters such as Noah, especially since the Bible is crystal clear about the personality traits of Noah (tongue in cheek*). To add further insult to injury, many people and beloved bible teachers can’t help but illustrate their extreme biblical and Judeo-Christian tradition illiteracy by attacking characters such as the “Watchers” and the story-line of animosity between Noah and the leader of the cities of Cain. These characters are not wholesale creations but are an intimate part of apocalyptic Jewish tradition. For example, the Watchers are embedded in Jewish tradition and extra-canonical texts such as The Book of Watchers via the tradition of Enoch, The book of Jubilees and even the Book of the Giants. They do indeed function as precarious figures who not only teach humanity metallurgy and the like, but also tempt them to sin and evil. But their role in the tradition is firm and poignant. As for the animosity between the Line of Seth (Noah) and the lineage of Cain, this has long been an interpretation within Jewish Midrashic and Christian attempts to make sense of language that occurs in Genesis referring to “sons of God” and “daughters of man.” While many contemporary Christians make fools of themselves thinking this refers to literal angelic beings, our forbearers knew something else must be done here. This language was interpreted as referring to the two lineages that oppose one another in the film: Seth’s line being the sons of god and Cain’s line being the daughters of men. What this all points to is not a freelance corruption of the biblical story but an imaginative portrayal utilizing biblical and Jewish traditions to continue telling the story of Noah in uniquely compelling ways. Christians have issue with this imagination, but even within our own Christian tradition Noah was rarely interpreted as a literal event that must be adhered to and retold with narratival integrity. Early Christian interpreters did not see the story of Noah as a literal tale of God’s righteous anger and sadistic justice but as a foreshadowing of Christ. Following a Christian allegorical representation, the story of Noah foreshadows that righteousness is expected by Christ. Noah is the Christ figure that represents life. The flood is not about literal destruction, but about salvation from death via Christ. The ark is understood as the Church, outside of which there is no salvation. The over indulgence of Noah after the flood which leads to his drunken stupor is read as an allusion to the Eucharist, or thanksgiving, that Christians commemorate when we give thanks and break bread rehearsing one history’s more fateful evenings. Yet the movies critics persistently bloviate over theological content rather than cinematic presentation. The argument, if there is one, is to be had over the latter, not the former. The film is being levied as “pagan” with “cultic” keynotes. Some Christian viewers say that it is an entirely fabricated narrative with little resemblance to how the flood really happened. Other criticisms make fun of the character of the Watchers as unbiblical and more akin to Lord of the Rings than the Bible. Shades of the following are also surfacing: the movie has little character development, God is not the central character, Noah is portrayed as a madman, evolution is being promoted, the movie deviates from the biblical narrative, and the producer is an atheist Jew. These criticisms are being broadcast on every imaginable form of media and countless people have already found Noah guilty of biblical heresy. For them, this movie is nothing more than something else to stand against, a cultural perversion of God’s Word, even while folks all around are engaging this film and perhaps turning to the pages of Genesis for the first time. Christians pray for occasions to share their faith and talk about scripture with others, but on this account many are passing up that opportunity…an opportunity to not only dialogue with others but to also dig into their tradition and learn. It is true that the film takes great liberty to develop and create an entertaining narrative, but who can blame the producers? The Genesis account of the flood is very sparse and there is little to no character development of Noah, his family or even God for that matter. Read the chapters. You will be surprised how many holes in the story Christians have filled with their imaginations instead of staying strictly to what the bible says. If we want to blame the movie for being sparse on biblical details, blame the exilic editors of the material for not giving us any. What would a movie being “true” to a verse by verse account of this story even look like? Not even Mel Gibson’s Passion of the Christ followed a verse by verse literal account of the Passion of Jesus and Christians loved that film. One obvious example is that in the Bible Noah only speaks one time, once! Not exactly what we need from a main protagonist. Yet we act as if we’ve had conversations with him and know him personally. And that one time is when he curses Ham for coming upon his “nakedness” while he is passed out from the fruit of his vineyard after the flood subsides. This curse is the narrative explanation for why the Canaanites are not true heirs of Gods Covenant with Abraham (to be introduced in Genesis 12) and also sets the stage for the Deuteronomic conquests that will comprise large parts of the books of Joshua and Judges. So Noah gets one sentence in his biblical role and it’s a curse. Not exactly encouraging. In the movie, Noah never curses his sons and this scene acts as a point of reconciliation for the family. In the film, Noah speaks often, cares about creation, and is a man that loves his family but also vigilantly wants to do God’s will. Sure he has character flaws and we don’t like what we see but this is the producer’s way of making Noah human and articulating our frail humanity in the face of momentously impossible divine callings. Noah has passions and passions scare the hell out of people without them. Where did Noah get the wood for the ark? How did he build it? Did anyone try to stop him? What did his family feel during this time? How did the animals arrive? How did the animals ride passively in this ark? Did Noah ever have doubts? How did Noah see the world? What sorts of evil was the world doing? How did the flood start? Where other biblical characters alive and did he interact with them? Did God verbally talk to Noah or is God silent like he is for many of us? The movies importance is not found in these unique and inconsequential questions, however. The power comes from the themes the movie introduces, themes that get to the core of faith. Have you ever wrestled with your calling and longed for discernment? Noah does too. Have you ever been compelled by a calling you can never see, just feel? Noah does too. Have you ever thought about the nature of judgment? So does Noah. Have you ever thought about how God’s judging might also appear evil? So does Noah’s family. Have you ever been asked how you’ll do what you’ve been called to do, only to respond, “I am not alone!” So does Noah. Have you ever thought about your own complicity in the sin and evil of the world? So does Noah. Have you ever thought about what grace and mercy looks like? Noah begs this question. Have you ever questioned the character of God? The movie is implicit with theology here. And unlike critics would have you believe, God is not absent in this film; God is the unseen character driving the plot and these questions stubbornly arise from this film to challenge our faith if we will let it. Yes, the film takes creative liberties, but the core idea that the world is evil, has turned from its Creator and must now be judged via a great deluge is present. Further, the film is not whimsical so much as it taps into the deep roots of Judeo-Christian tradition via the Watchers, the animosity of lineages and even the role of Methusaleh. Doing some homework would do the blogosphere, and many pulpits, a lot of good. If we have a problem with the “myth” of the movie, perhaps we really have a problem with our own myths. For all the banter being leveled against the film it appears that there remains not only a huge cultural interest in the film and its message, but also global interest in religious ideas linked to the bestselling book of all time: the Bible. Such interest and attention needs to be embraced by followers of Jesus, not dismissed because of a faulty perception of how biblical stories must look on the big screen by people who are less than qualified to pass such judgments. If we want something to generate conversation across cultural and religious boundaries here is our chance. In a context in which the church is becoming increasingly irrelevant for a flood of reasons (pun intended), the church should seize this opportunity to engage discussion about faith with many people who would usually be less than interested. We should seize this time to discuss faith and culture, Christ and context, old stories and the new ones we are creating via our lives. For a rare time in our culture people are talking about the Bible. This is a good thing. Let’s make sure we’re joining the conversation without our feet in our mouths. Excellent post! Thank you for taking the time to write it. I especially appreciate the questions you list at the end. Perfect questions for reflecting on this in a group setting.